The first time that they went into the walled off crypt on the far outskirts of the village, they were warned by the local officers that if they were seen going anywhere near the place again, they’d be locked up for every weekend for the rest of their lives. That, of course, only inspired them to head back and see what exactly had been the big deal. The place looked creepy enough, no doubt, but it didn’t seem exactly dangerous… just decrepit and long-ignored. They’d heard all the folk lore: tall tales about terrifying specters that rose up from the depths of the mausoleum bent on gaining vengeance for forgotten misdeeds. Curses. Ha! The second time that they visited, though, was very different. First came the strange moans. Then came the strange scratching against the stone walls. Then they saw the eyes… the wide open black yes that seemed to contain just a speck of dead hate. When the thing drew back its cowl, revealing freakish tendrils, they stood in abject horror. But, when it opened its sharp tooth-filled maw and cried out, they fell to their knees, panic-stricken and paralyzed. That is the tragic tale of those who have strayed too close to the haunted crypt. Rumors are that those few who have been visited by the terrifying crawler of the crypt became consumed and turned into one. But… that’s just a story, right? You know differently, of course, for you are one of its victims. Unfortunately for us, you are not bound to the crypt and are ready to come to the village to find new victims! 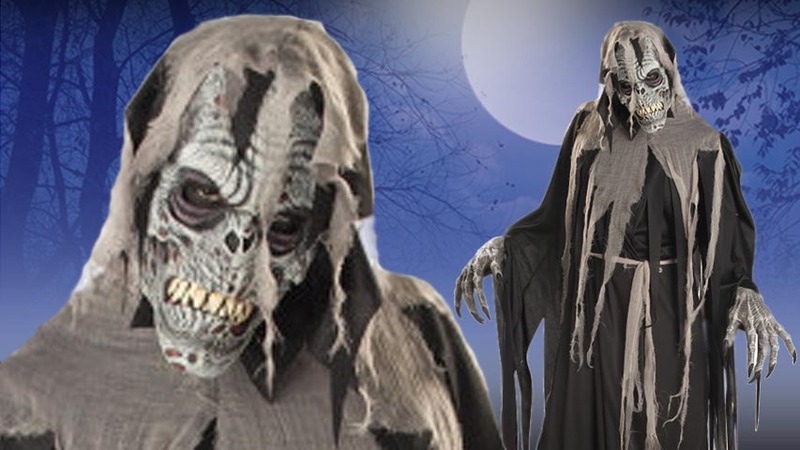 Bring true terror to you friends in this Scary Crypt Crawler costume. Polyester interlock knit and cheesecloth fabric makes up your pullover black death robe and molded latex rotting hands will freak out your victims as you brush pointed talons along their cheek. But, it will be when you open your mouth and the mask’s ani-motion mouth and lips respond to issue forth your dreadful cry that they’ll go running for shelter! But… it will be too late, won’t it? 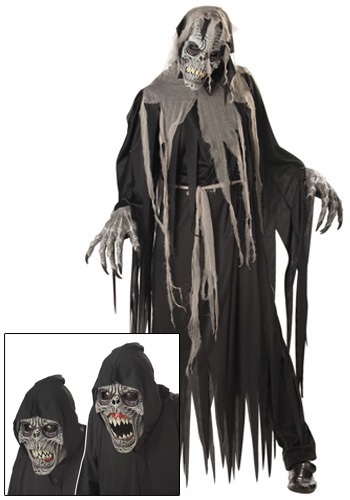 Wore this last year for the Halloween party in our backyard. We live in Florida, so the mask was hot and I didn't wear it much except for pictures. The problem with the mask was that the hinge on the jaw was rather tight, which made the animation effect difficult to achieve. All in all a decent costume and a few of the kids were properly scared when I was fully attired. We were under the impression that this mask made noise when the mouth moved and it does not. My son was very disappointed as was I.